Spring forms – not just for cheesecake anymore. 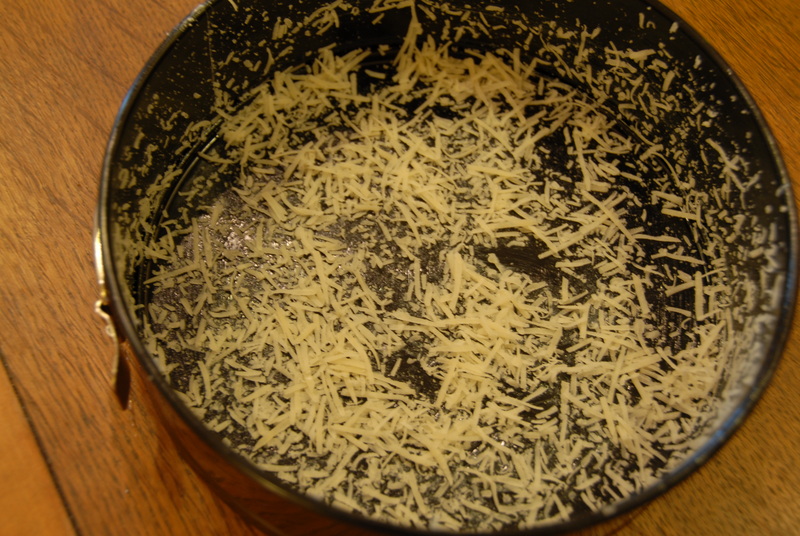 Coat a 9″ spring form pan with butter and sprinkle with parm. Set a pot of water on to boil and preheat the oven to 375 degrees. Trim asparagus and coat with olive oil, salt and pepper. Roast in the oven for about 20 minutes until tender and slightly crisp. Once cooked cut into 2 inch pieces and place in a large bowl. Cook peas in the salted boiling water for about 2 minutes. Drain and set aside in the same bowl. Cook pasta in the same water until just under al dente. Drain and place in bowl with the peas and asparagus. Cut the fresh mozzarella into small cubes and place in bowl as well. 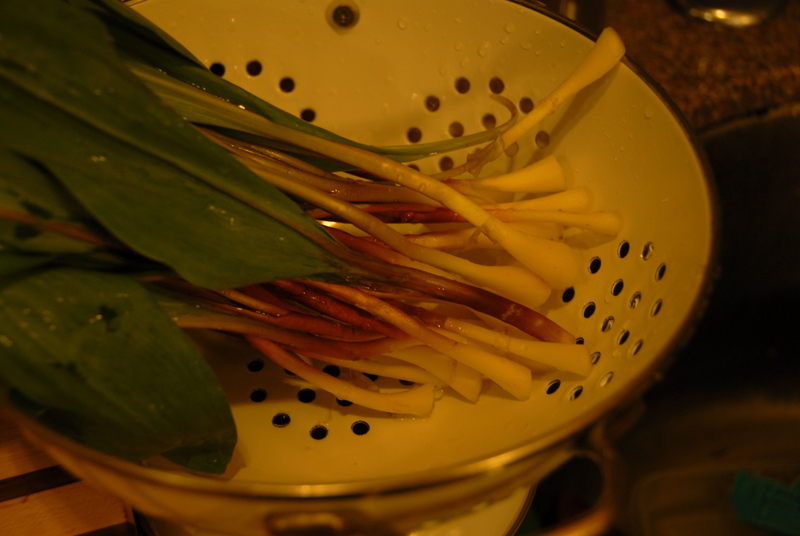 As for the ramps, clean well and cut into 2 inch segments – saute in olive oil and butter. Season and set aside in bowl with other ingredients. Join the ricotta, lemon zest, a dash of salt and olive oil in a separate bowl. Mix to combine. 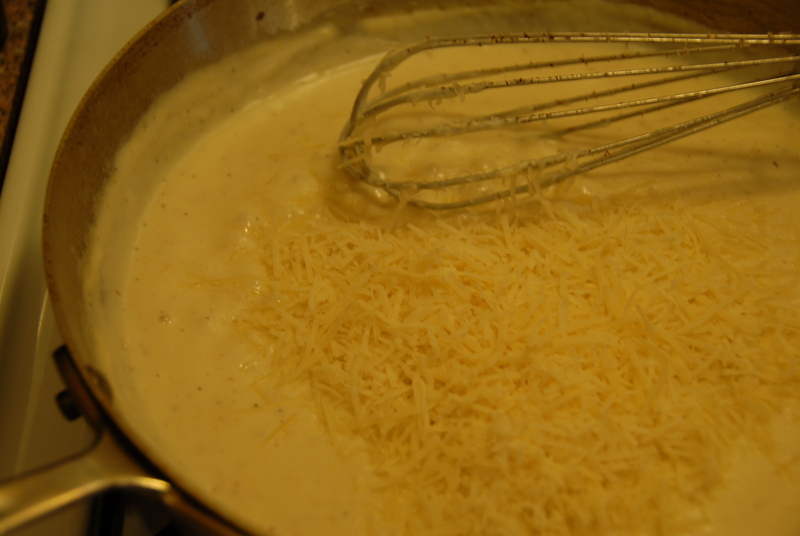 For the sauce – a cheesy bechamel – melt the butter in a pot (or for extra flavor and less dishes use the same saute pan used for the ramps) over medium heat. Once it’s melted sprinkle in the flour. Whisk for a minute or two to cook. Slowly whisk in the milk making sure there are no clumps of flour/butter. Bring up to a gentle boil while whisking. 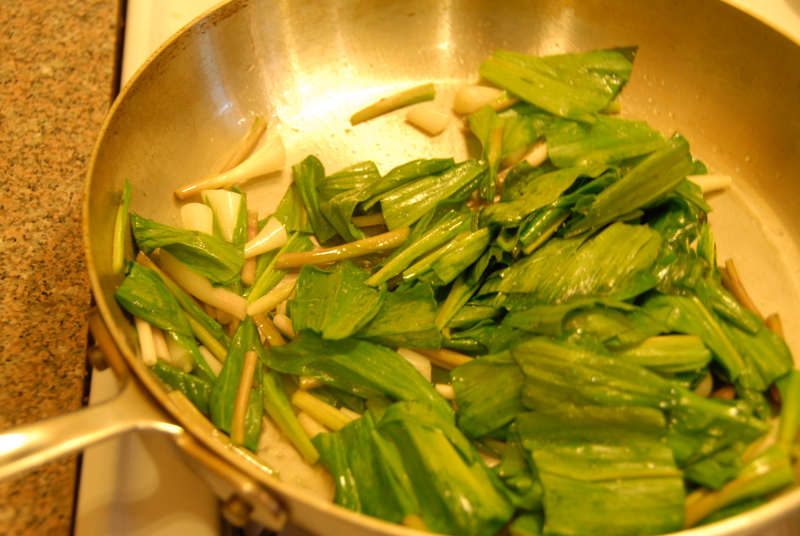 Allow the sauce to get thick, stirring often so not to burn – 5-8 minutes. Season the sauce well with nutmeg, salt and pepper. Add 1 cup of Parmesan, mix well. Pour the sauce over the pasta and veg. Mix well. 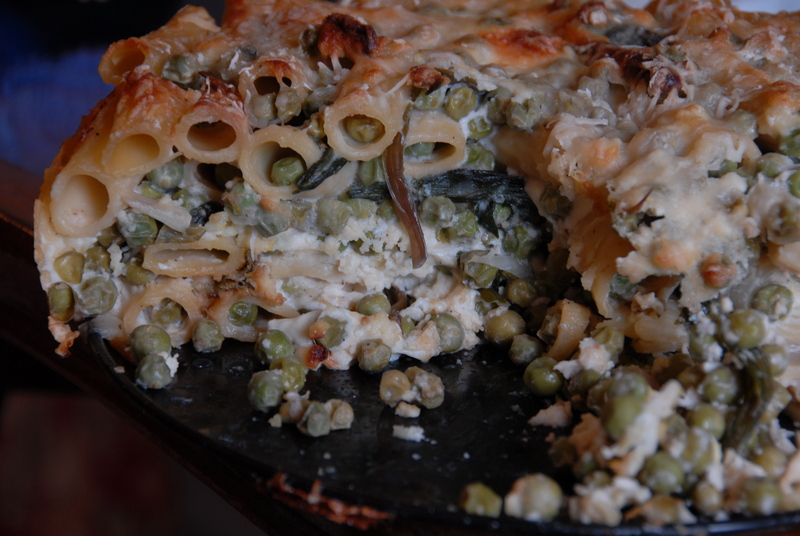 Layer half of the pasta mixture in the prepared spring form pan. Gently press down on the mixture to pack well. Next spread the ricotta mixture evenly over the pasta. Layer in the second half of pasta. Top with a healthy sprinkle of parm and bake for 30 minutes until the top is nicely browned. Let rest for 30 minutes before releasing the spring form and digging in. Now tell me, who’s going to say no to a piece of this pie? 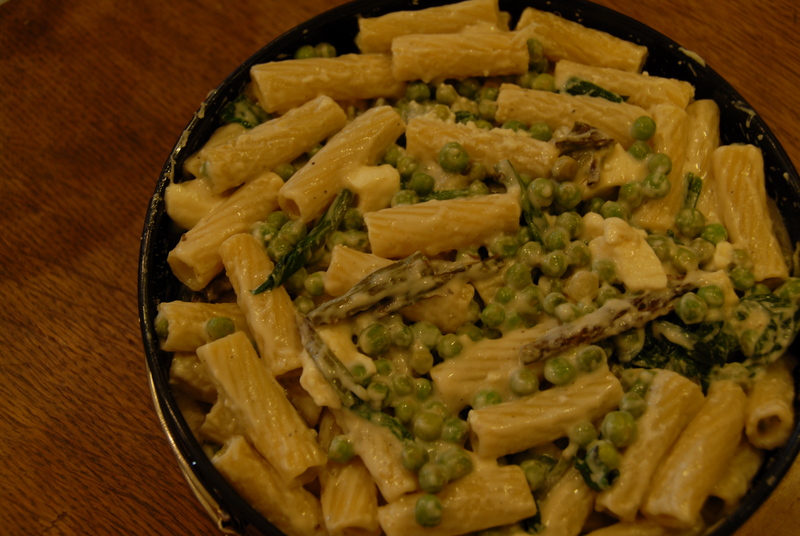 This entry was posted in Lemon, Peas, Ramps and tagged asparagus, lemon, pasta, peas, pie, ramps, ricotta, spring form. Bookmark the permalink.